← Why has Rachel Maddow incited war with Russia at every opportunity? Why is former US Ambassador Samantha Powers backing up coup plotter John Brennan? Earlier today, former CIA director and the man who cast a vote for Gus Hall-Angela Davis (that would be the Communist Party/USA) in 1980 because Ronald Reagan scared him, John Brennan, for lack of a better description, totally lost his sh** after President Trump did his little happy dance to celebrate the firing of Andrew McCabe. 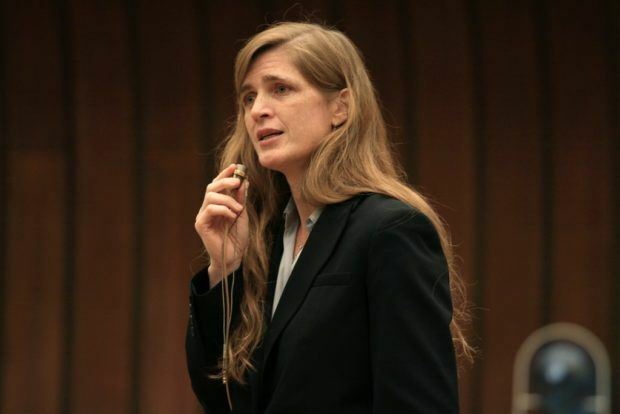 This prompted Samantha Power, the architect of the al-Qaeda takeover of Libya and the ongoing genocide in Syria and the person who unmasked the identities of at two U.S. persons every workday because the duties of UN Ambassador made it necessary. to give President Trump a stern warning. Really? I can see where if you were standing near him in a strong wind that turkey wattle thing he has going could get kinetic and possibly cause damage. Beyond that, or so we’ve been told, he’s a retired guy and the “deep state” is a myth. This is not how a free society operates. The permanent bureaucracy is always subservient to political leadership and the moment it ceases to be so, it begins to be the enemy of the republic. I think most of us have been appalled at what we’ve learned about the way Comey’s FBI acted. I’m sure that if Dan Coats were diligent, he’d find abuses under Clapper and Brennan that would make us think Comey lack any ambition whatsoever. Of course, given the performance of Brennan’s CIA, it is more likely than not the bluster of a tired old has-been.